You can't miss the bright yellow Olin Marler cruise boats. These skippers know where to find the bottlenose dolphins, and can have you in position to take photos of bottlenose dolphins in minutes! These are very enjoyable cruises, and very popular here at destin florida. A large school of bottlenose dolphins swim off the Destin area beaches. From time to time you can see them from the beach. If you want to be sure you see the dolphins, take one of the Olin Marler Charter Boat Service dolphin cruises. Dolphin Cruise on The Hannah Marie! You can see dolphins up close on these cruises. 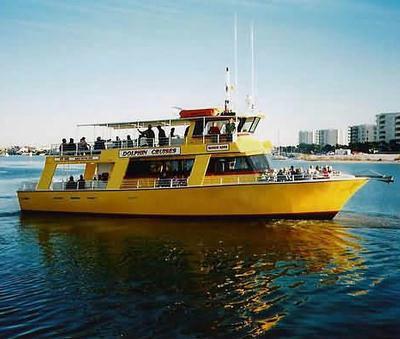 A dolphin cruise can be the high point of your Destin adventure! Look for the Olin Marler Charter Boat Service kiosk between AJ's and the Lucky Snapper Restaurant. The Hannah Marie under way on another dolphin Cruise. The Olin Marler captains know where to find dolphins. Cruise in comfort on a Olin Marler dolphin cruise! Olin Marler also has fishing charters! Check out Destin Deep Sea Fishing Trips from Olin Marler Fishing.